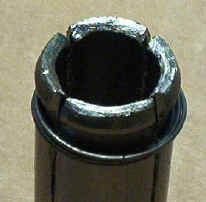 Crimping the heeled bullet is the tough part of the reloading process. 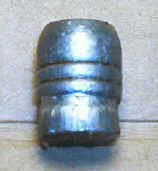 Since the bullet is the same diameter as the outside of the cartridge case you cannot use any type of "normal" crimp die. Reading the oldtimers they had various ways they did it including a pliers-type arrangement. Looking at it I figure the collet-type die that closes in from the sides has got to be one of the best arrangements. Lee Precision makes these for some calibers and says on their website that they will custom-make them for a reasonable price. We called and after discussions were told that the cartridge is too short for them to be able to make a die for. I figured they did not want to mess with it and that heck, I could make one. So I ordered a .44-40 Lee collet die and went to work on it. It was apparent immediately why they could not make it work ... the slots in the sides of the crimp body are too long and it cannot be shortened for a cartridge as short as the 480 Achilles. Hmmm ... well, they were right about that. But I still felt I could come up with something. So I ordered a .45-70 Lee collet die. When it arrived I looked it over for a couple days, trying to figure how to make it work. Then I hit upon the idea of using a spacer under the 480 Achilles cartridge to hold the case at the proper place for the die to crimp it. I pulled the die apart and took the spring off the top of the crimp body. Since the .45-70 is designed to crimp a larger diameter bullet than the heel on the 480 Achilles I opened up the slots in the crimp body with a hacksaw. My work here is crude. It could be made to look a lot nicer.... but this works. 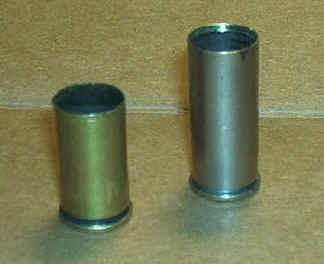 The spacer is made from a shortened 45 Colt cartridge. This is with the spacer too long. The Achilles cartridge should be down inside the die body below the bevel. 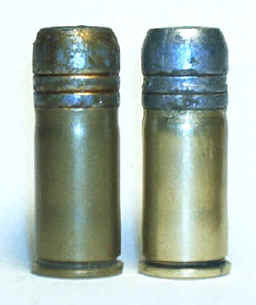 Use an unfired 45-70 cartridge to show you the approximate depth. Crimping with the collet die at first the crimp was very broad, making the cartridge look almost bottle-necked. I was not getting roll crimp. While it worked, I did get some bullet pull with loads that produced more recoil. I figured I could make the 45-70 Lee crimp die work better.... I mean, what did I have to lose? So I started looking at it closely. 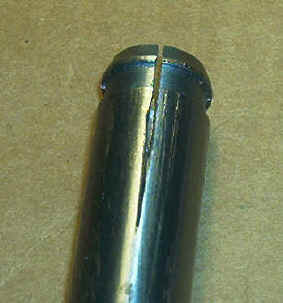 If I made the spacer short enough that it crimped more of a roll crimp, it crimped into the bullet . 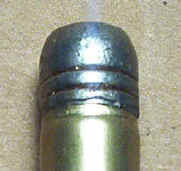 See the crimp marks on the bullet here? So I got out my portable machine shop (otherwise called a Dremel Tool) and went to grinding. Cutting and trying, I soon saw I needed to remove some of the top end of the die and bevel it enough that it would not hit the bullet when it crimped. I also opened up the slots in the sides with a small needle file, so that it could close tighter on the cartridge. 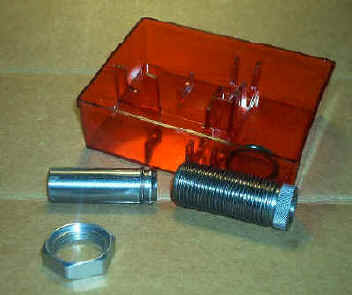 The crimp die was made originally to crimp a .458" - .459" bullet. The heel is .455" so I figured a little tighter won't hurt anything. The crimp now is much smaller than before and bites into the bullet heel pretty well. I have all my cases loaded right now, but will give it a try and see how it works as to bullet pull as soon as I can. After this I did a little more work on the crimp die, angling the top some more, and I shortened the spacer a bit more. A few tries and I had it where I wanted it. This is now a much more "normal" crimp. A trip to the range and I will know whether it will hold under recoil or not. I am pretty sure it will. I loaded several dummy rounds and then pulled the bullets and it bites into the heel pretty well. If this works perhaps we can make up some that would look a little nicer, since we can use the data from this one to make the others. I loaded 5 rounds of "heavy" loaded 480 Achilles - 900 fps loads. I marked the base of a 6th round with a marking pen and loaded it in the remaining empty chamber. I then fired the five unmarked rounds, stopping and checking the marked round after each shot, to see if the bullet moved. I fired all 5 rounds and the bullet did not move. The crimp works!! Kelye at Belt Mountain Enterprises modified a die for me. 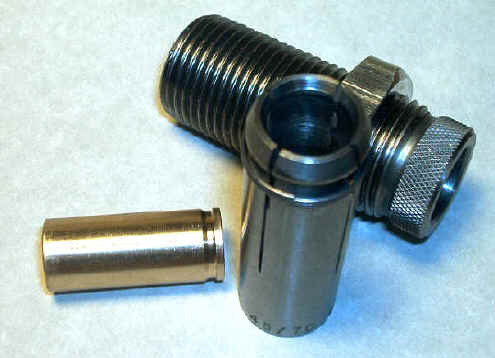 He came up with a spacer that fits the .45 Colt RCBS #20 shellholder, making it a lot more convenient to crimp the bullets.